© Existing estimates of ocean heat transport (10^15 W = 1 PW). Our study will provide a new section across 36°N. The mechanisms which control the heat transport, nutrient and carbon budgets of the North Atlantic Ocean have yet to be clearly identified, which affects our understanding of how the ocean is warming, phytoplankton grow and how the oceans uptake CO2. There appears to be a loss of inorganic nutrients over the subtropical gyre and it is unknown how the nitrogen (N), phosphorous (P) and carbon (C) budgets are closed. Recent observations suggest that there is less uptake of CO2 than expected over the North Atlantic (with an implied outgassing of anthropogenic CO2), compared with predictions from carbon models. We will address how the nutrient and carbon budgets are controlled by conducting a full depth, eddy resolving, hydrographic section across the northern boundary of the subtropical gyre at 36°N and including, for the first time, measurements of organic N, P, and C, and a full carbon system analysis. The heat flux across the 36°N section will be evaluated, which was not undertaken during the World Ocean Ciculation Experiment (WOCE) but has been identified as fundamental to understading poleward heat transport. There is a unique opportunity to take these obeservations and combine with data from three already funded cruises in the North Atlantic in 2004/2005 under the RAPID and AMT programmes. The study will include a synthesis of these measurements by developing and applying an inverse model and a coupled biogeochemical, isopycnic circulation model. At present, there is uncertainty in the estimate of heat transport across 36°N. Previous inverse models of heat transport across 36°N differ by 0.4 PW, raising questions about the reliability of nutrient transport estimates. Air-sea heat exchange estimates are ambiguous for the region between 24°N and 36°N associated with uncertainties in the large heat losses to the atmosphere over the Gulf Stream. 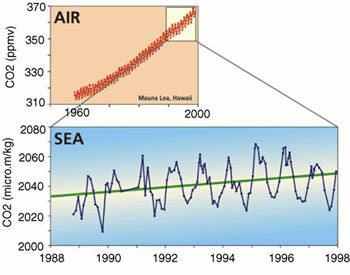 © Diagnosed ocean heat content change (10^21 J) for 20 y periods centred on 1990 annd 1960 (Lozier & Moore, 2003). Note how the Atlantic Ocean is warming at low and mid latitudes, but cooling at high latitudes. The proposed new section along 36°N would define the structure of meridional heat transport through the N. Atlantic and help differentiate in the heat loss between 24°N and 36°N implied in the air-sea flux climatologies. The 24°N and 36°N sections showed that the subtropical gyre had warmed since 1957, and reoccupation of the 24°N during WOCE demonstrated continued warming over 35 years. The new 36°N section would help define the structure of decadal changes in water masses within the subtropical N. Atlantic. At present, it is unclear how the N and P budgets are closed over the N. Atlantic. Inverse models suggest that there is a loss of nitrate and phosphate over the mid latitudes of the subtropical gyre. The inverse models differ in the detail of their predictions, with the loss of nitrate based on a northwards flux at 36°N and a zero flux at 24°N from one model, while there is a southwards flux at 24°N from another model. This implied loss of nitrate and phosphate might be offset by an influx of organic nutrients. In particular, there might be surface, wind-driven influx of dissolved organic nitrogen and phosphorus from neighbouring upwelling regions. Alternatively, atmospheric inputs of N and P might provide a role in closing the budgets. Nitrogen fixation provides a significant source of N to surface waters, but there is no equivalent source for P.
It is unclear as to how anthropogenic carbon is transferred over the N. Atlantic. 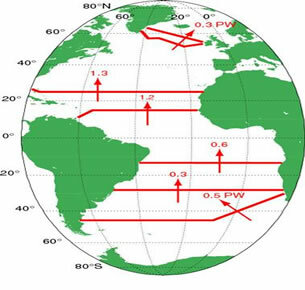 Coupled carbon and circulation models suggest that the N. Atlantic should be a sink of anthropogenic C. However, transport studies at 24°N and in situ estimates of air-sea fluxes suggest that the N. Atlantic is a source of anthropogenic C (with the partial pressure of CO2 rising faster in the surface waters of the N. Atlantic than in the atmosphere). The reason for this contradiction is presently unclear. A possible factor might be a reduction in convective activity over the region leading to an increased stratification, increasing C in surface waters and reducing the subsequent uptake of CO2 from the atmosphere. In common with N and P, the transport of dissolved organic carbon (DOC) might be important, possibly sustaining net heterotrophy and controlling the oxygen distribution over the N. Atlantic. A detailed, hydrographic survey along 36°N with a complete biogeochemical analysis of inorganic N and P, organic N and P, inorganic and organic C, and transient tracers, such as SF6. An inverse model estimate of the circulation based on hydrographic sections across 26°N and 36°N, as well as deep ARGO float data. The inclusion of the float data is to improve the reliability of the estimates of the deep transports (which are particularly important for the biogeochemistry, as there are relatively strong gradients in N,P and C in deep waters). Use the inverse model to evaluate the heat, N, P and C budgets (including both inorganic and organic forms) for the subtropical N. Atlantic. Identification of the transport of anthropogenic C across 36°N, and release or uptake between 26°N and 36°N. Evaluating anthropogenic C requires estimating the age of the subducted waters (i.e. the time when the water was last at the sea surface). This will be achieved by measuring the SF6 concentrations, which like the past use of CFCs can provide a clock to identify the age of subducted waters. Model the pathways for N and P, including both the inorganic and organic contributions, over the subtropical N. Atlantic. Identify how decoupled the N and P budgets are due to both the presence of nitrogen fixation, and differential remineralisation of DON and DOP.